The latest version available for the Linux systems is Brackets 1.3, coming with the below changes. Expand/collapse blocks of code (code folding): Click the indicators next to the line numbers, or use the shortcuts in the View menu. Anonymous data to help improve Brackets: You can preview the data that will be sent, and opt-out if desired. We’ve gone to great lengths to protect your privacy and maintain transparency about what data is sent – please read our blog post for details. Better auto-unindent when ending a block: Works with multiple cursors, better indentation in JS switch statements, etc. 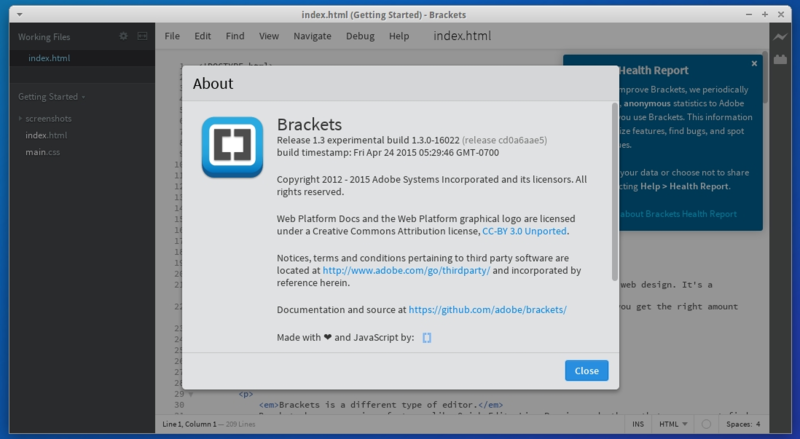 In this article I will show you how to install Brackets 1.3 on Ubuntu 15.04 Vivid Vervet, Ubuntu 14.10 Utopic Unicorn, Ubuntu 14.04 Trusty Tahr, Ubuntu 12.04 Precise Pangolin, Linux Mint 17.1 Rebecca, Linux Mint 17 Qiana, Linux Mint 13 Maya, Pinguy OS 14.04, Elementary OS 0.3 Freya, Deepin 2014, Peppermint Five, LXLE 14.04, Linux Lite 2 and other Ubuntu derivative systems. Thanks, brackets is an amazing product! Thanks, i tried install brackets from .deb but i have some problems with the dependences, usign this repo is easy the installation. Thank you for posting this. It was a hUUUUUUUGE help.